Today is the day we’ve been waiting for! March 20 – the First Day of Spring! As you can tell from reading our blog, the winter has its charm in the kitchen. Good, hearty meals are fun to prepare and are a welcome comfort when its snowing, windy, cold, or all of the above. Usually, to find inspriation for the blog, we blog surf, check out our favorite magazines, or flip through cookbooks. Occasionally, however, this gets old and even though there are tons of recipes we haven’t cooked, it seems like it’s all the same. 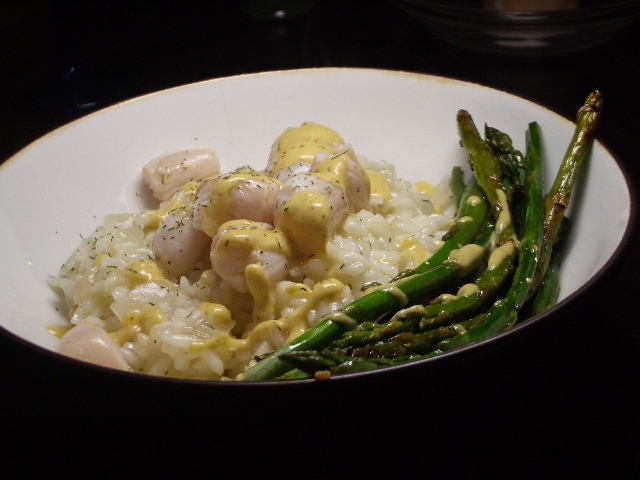 Then we read a post on Raising Foodies (cute blog title and cool topic, too) about a scallop dish they had at a restaurant. The blog post didn’t include the recipe, but we set out to make it for ourselves, creating as we went along – and we came up with this recipe! So, now, in addition to our cookbooks, magazines, and favorite blogs, we’re also checking out our favorite restaurants and challenging ourselves with their menu items. Fun idea, huh?